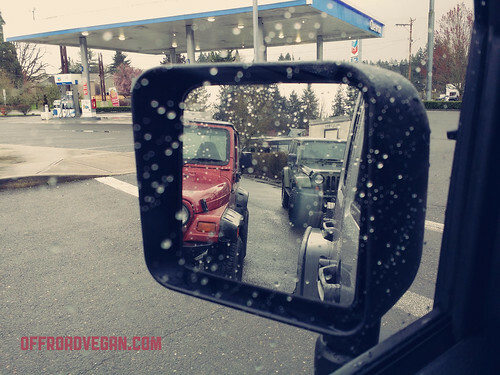 As with most Jeeping trips, our day began relatively early, meeting up with our buddy Rob at the North Plains Chevron station. 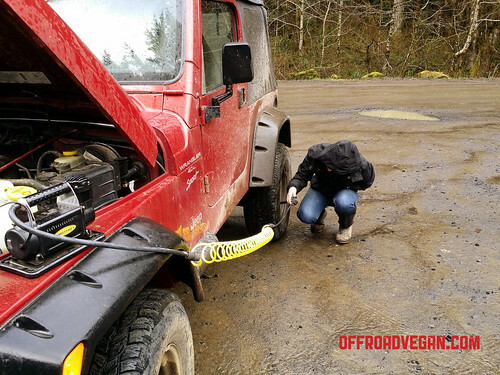 I swear these small businesses survive on the dollars brought in from all these pre-TSF offroad trips. This trip was awesome on many different levels. Primarily, it was my little sister Jess’ first time EVER wheeling, especially with her 1999 TJ, still tagged with Vermont license plates. Second, I was taking my new offroad trailer out for the first time, hoping to see how well it would perform. Last and definitely not least, we were wheeling with our friend Rob for the first time. My one main gripe with the TSF management is that we could not find a map ANYWHERE, and nothing is marked. So, we had a bit of route finding to get to Cedar Tree. Eventually, we bumped into another group that adopted us and helped us find the trailhead. The beginning of Cedar Tree. 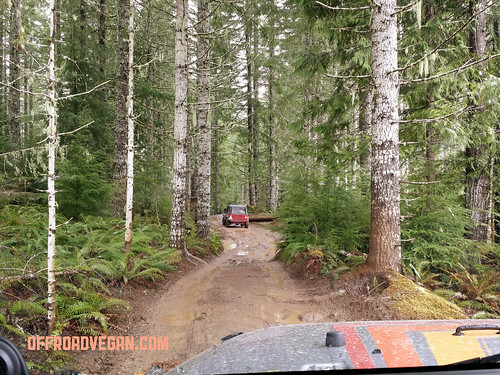 The trail begins in a clear cut off a ridge road. It climbs steadily, and the trail is narrow, but easily passable. Loose rocks and a little mud. After the first road crossing, this section used to be pretty nasty at the end; however some recent changes removed the boulders and trees that made it a turn fest. 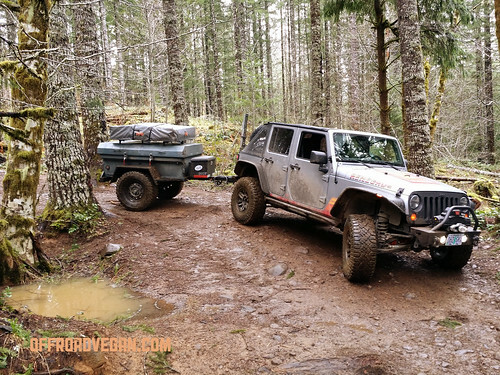 I was nervous about this section with the longer wheel base Jeep, let alone with a trailer. While I still made a few adjustments, it was easily manageable with some spotting help. Jess approaching the tighter spot on Cedar Tree. Rob passing through the same spot. This used to be pretty tight. After the second road crossing, the trail enters some beautiful dense woods which comprises most of its’ remaining length. There are only a handful of tight spots (the infamous “rooted hill of death” has been repaired) and some water areas. 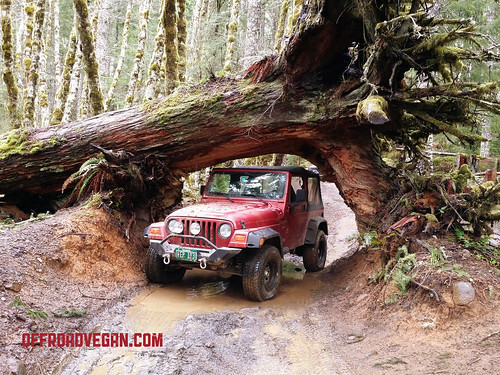 You will soon approach the trail’s namesake: A huge downed cedar tree with just the right shape and height to let most Jeeps pass underneath. On my first (and last) attempt, I broke my soft top on this tree, so be warned and always have a spotter. Jess’ TJ poses under the cedar tree. After the tree, the trail continues to meander through lush forest. In the Summer months, this trail is a great escape from the heat. 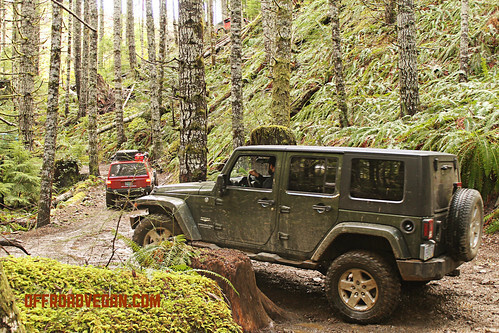 The remaining tight spot (just prior to the old ‘rooted hill of death’) will have the 4 door Jeeps making an extra turn. Rob making an extra turn in this tight spot. The remainder of the trail is beautiful, but uneventful. 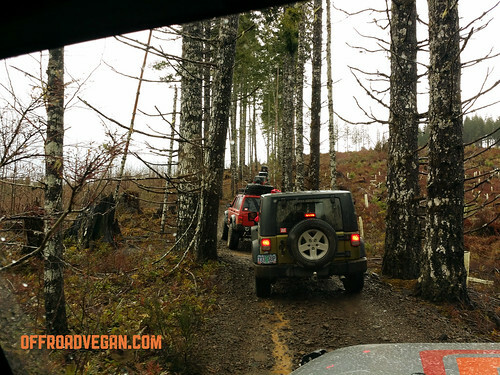 Be sure to enjoy the slower pace of this trail and the beauty of being in the forest. Once you complete the trail and enter a wide parking area, try your luck at climbing the dirt piles. 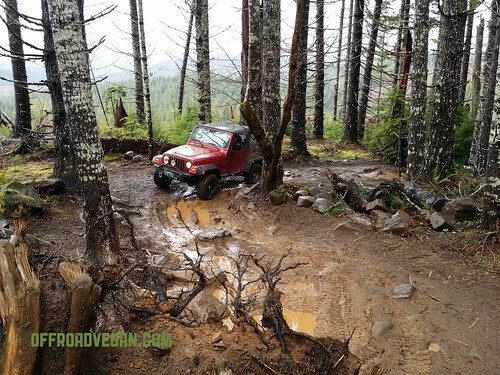 Follow the forest roads down to Brown’s camp to air up. The trailer performed flawlessly in all conditions we experienced (I even ventured down to Firebreak 5). 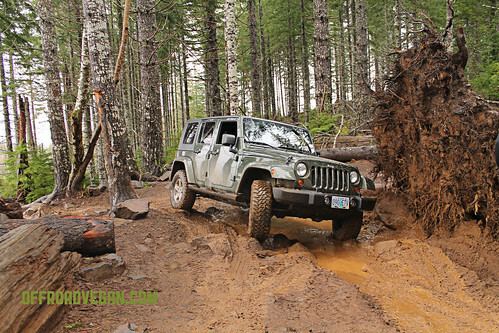 I am very impressed with how maneuverable it is, and how well it tracks behind the jeep – both on and off the road. 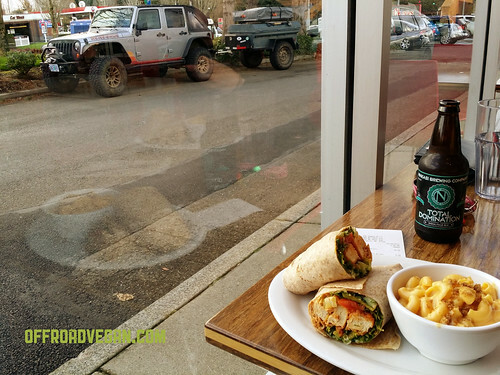 In the end, we made our way back to Hillsboro for the requisite stop at Veggie Grill for a beer and a Buffalo Bomber (wrap style, of course). Another trail day completed with a beer and buffalo bomber.